I caught a film back in November titled “Beautiful Boy” that was about the sad demise of a teenage drug addict and the agony his father went through attempting to save his kid from a deadly addiction. 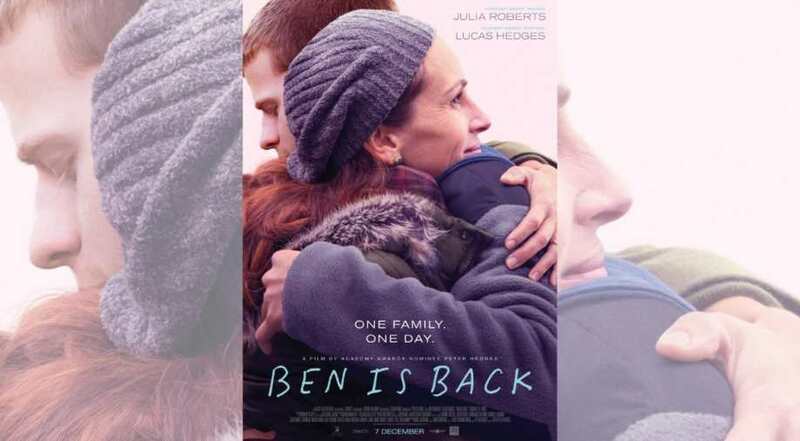 Now, two months later, another film has been released, “Ben Is Back”, that is quite similar in subject but deals with an extremely distraught mother instead. Starring Julia Roberts as Holly Burns, the movie revolves around the sudden return on Christmas Eve of her teenage boy Ben (Lucas Hedges) from a 77-day stint at sober living. While “Beautiful Boy” chronicles a far greater time period and shows a kid’s slow descent into drug addiction, “Ben Is Back” covers only a 24-hour period, yet it feels like it covers an eternity, especially when viewed from Holly’s perspective. It’s obvious the whole family is on edge when Ben abruptly returns, all except for his youngest niece and nephew who couldn’t be gladder he was back. His sister Ivy (Kathryn Newton) on the other hand seems quite upset about him being there, as does his stepfather Neal (Courtney B. Vance). While we aren’t shown the exact reasons why, it’s made overly apparent that Ben has ruined each of the prior Christmas’s because of his drug addiction and that no one trusts him. After Neal agrees Ben can stay for a day to share the holiday with his family, Holly sets down some serious ground rules that Ben must abide by, of which he agrees. While Ben does his best to proclaim how much healthier he is and how he doesn’t ever want to go back to drugs, it doesn’t take very long for the temptations of it to return. As Holly desperately tries to keep it together and cling to control of her son from relapsing, the plight of her teenage drug addict son quickly becomes all too real once again. Because I was closer to my mother and sister, rather than my father, I related far more to “Ben Is Back” than “Beautiful Boy”. During my addiction-laden years, I saw the very same sadness and trust issues that my addictions caused in them. My mother never did get to see me as a fully sober individual, but thankfully my sister has and years later, we’ve been able to mend our relationship and grown much closer. Nevertheless, “Ben Is Back” moved me incredibly and reminded me once again of all those addictive periods in my life where I too made promises just like Ben but never kept to them, where I said all the right things, yet still tore the curtains down, and where I had such potential but never quite reached it. That’s why it was utterly heart-wrenching for me to watch Holly try to control her son’s disease. Like “Beautiful Boy” demonstrated just as well, there is no controlling ANYONE’S addiction. Parents, family members, and other loved ones often try anyway though and in turn, shell out huge amounts of time, energy, and money in an attempt to rid the disease from the person they love. No matter what the addiction is, the only person who can end it is the addict themselves. They must find the desire from deep within to be rid of it and that tends to usually come by connecting to a Higher Power in one of their bleakest moments. No matter how many attempts my mother or sister, or anyone else for that matter, made to help free me from any of my addictions, I kept falling back into them time after time. It wasn’t until I finally got sick and tired of being sick and tired from my addictions did I ever make the change. It wasn’t until I had lost pretty much everything that meant something to me did I ever make the change. Thankfully, both “Beautiful Boy” and “Ben Is Back” portrayed that reality oh so well. Sadly, Ben Is Back doesn’t get into the 12-Step programs out there that support people like Holly, Ivy, or Neal, people who have become seriously codependent and addicted in their own way with their constant attempts to remove a loved one’s addiction. CODA, Al-Anon, ACA, and a number of others all exist for this reason. Hopefully, if you’re someone who’s struggling with an addict that you love dearly, you’ll consider checking out one of these programs and also watch both “Beautiful Boy” and “Ben Is Back”, as doing so, you’ll get the truest picture of what your reality really is with any addict.